Why not use our phones as guides and helpers with our daily tasks? Choosing the right services for our needs can be difficult, finding the one with the best qualities and ensuring that we’ve made the right choice it can be confusing. Many apps can help you find the best services in your surroundings effortless and fast. How to choose the best app for this specific purpose? 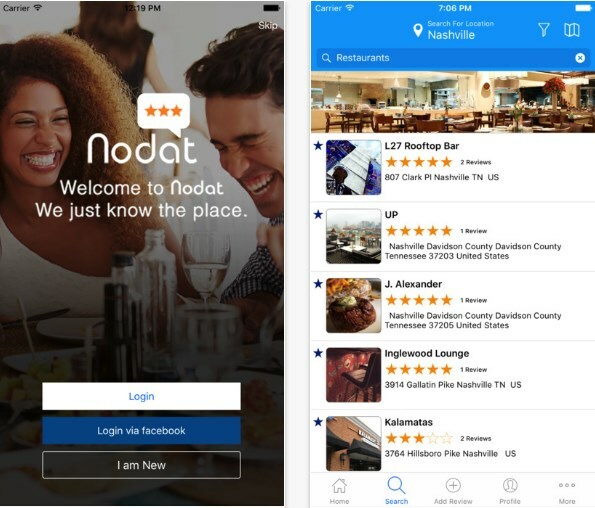 We searched and we discovered one practical local guide app to help you – Nodat. Let’s talk about this app. What is Nodat all about? Nodat is certainly one simple to use app, suitable for users of android and IOS that need a tool to help them find different services in their area without any effort. The app is specially created to help people to search for a specific service and get complete information about the best offerings for that services. Also, the users can use the reviews on the app to make their decision easier. From health services, restaurants or night clubs, dentists, to fitness centers, the app is a great local guide for people to make their daily life more productive. This lifestyle app is a great tool for finding the best services in the area without losing a lot of time searching online. The app gives complete information about many services, giving the users, helpful reviews of the services they need to help them make the best decision and choose the right service. The users that are in need for plans for trips or info about towns, mover services or realtors, only with one click on the app can get the best offerings and choose the right service from them. Also, users can use the app for finding quality health centers, child care or pet centers, look for the best restaurants, bars, and night clubs in their surroundings, or even find amazing fitness centers in their area. With many video reviews about every specific service, the users can make the right decision fast. Download the app on Google Play and App Store for free.